What Foods Do Sugar Gliders Eat? 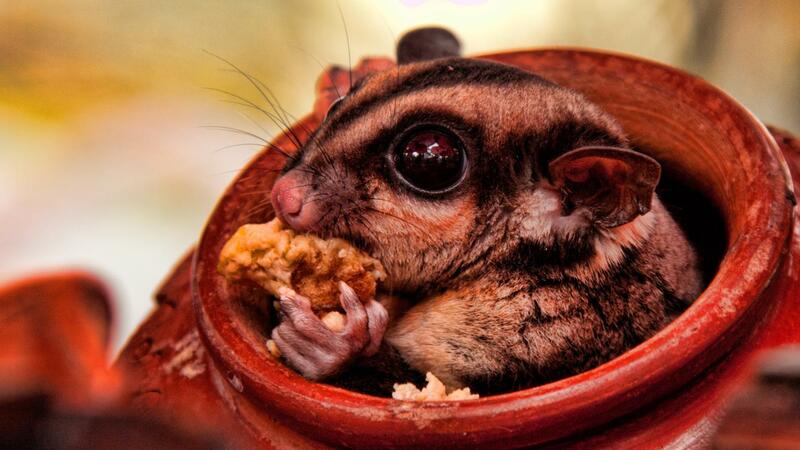 Sugar gliders are omnivorous mammals that typically eat small insects, sap, eucalyptus gum and nectar in the wild. Gliders kept as exotic pets may eat homemade blends of honey, boiled eggs, high-protein baby cereal and vitamin supplements to stay healthy. The animals have a preference for sweet foods and enjoy fruit and vegetables as treats. Sugar gliders in the wild are likely to get the correct balance of nutrients from local insects and flora, but those living in homes require careful attention to their dietary needs. Foods containing high levels of protein, obtainable from store-bought insectivore foods and high-protein cereals designed for infants, are good choices for pet sugar gliders. A mix of fruits and vegetables, chopped and served together to prevent gliders from simply eating their favorite types, serve well as an occasional snack for gliders. The correct ratio of calcium to phosphorus in a sugar glider’s diet is essential for warding off metabolic bone disease. Owners and veterinarians should ensure that gliders get plenty of calcium, from foods or supplementation, to offset the potential harm that high-phosphorus foods can cause for the animals. Meals should contain between one and two times the amount of calcium as phosphorus to help prevent this common disease. Do Eucalyptus Leaves Get Koala Bears High? How Do Koalas Protect Themselves? Do Possums Sleep Upside Down?